Police officers stand guard a facility for the disabled where a number of people were killed and dozens injured in a knife attack. AT LEAST 19 people were killed and about 20 wounded in a knife attack last night at a facility for the disabled in a city just outside Tokyo in the worst mass killing in generations in Japan. 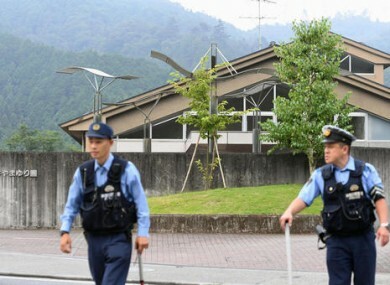 Police said they responded to a call at about 2.30 am from an employee saying something horrible was happening at the facility in the city of Sagamihara, 50 kilometres west of Tokyo. He entered the building about 2.10am by breaking a glass window on the first floor of a residential building at the facility, Shinya Sakuma, head of prefectural health and welfare division, said at a news conference. Kanagawa Governor Yuji Kuroiwa expressed his condolences to the victims. A woman who lives across from the facility told Japanese broadcaster NHK that she saw police cars enter the facility around 3.30am. “I was told by a policeman to stay inside my house, as it could be dangerous,” she said. Then ambulances began arriving, and blood-covered people were taken away. The facility, called the Tsukui Yamayuri-en, is home to about 150 adult residents who have mental disabilities, Japan’s Kyodo News service said. Mass killings are relatively rare in Japan, which has extremely strict gun-control laws. In 2008, seven people were killed by a man who slammed a truck into a crowd of people in central Tokyo’s Akihabara electronics district and then stabbed passers-by. More recently, 14 were injured in 2010 by an unemployed man who stabbed and beat up passengers on two public buses outside a Japanese train station in Ibaraki Prefecture, about 25 miles (40 kilometres) northeast of Tokyo. “I never imagined such a horrible thing happening,” Chikara Inabayashi said. I was astonished, that’s the only thing I can say. Email “At least 19 people killed and 20 wounded in attack at centre for disabled people”. Feedback on “At least 19 people killed and 20 wounded in attack at centre for disabled people”.